'David' produces massive heads of pure white fragrant blooms that remain lovely well into fall. Excellent in perennial borders, beds and containers that are in full sun locations. This mildew resistant variety produces large clusters of fragrant flowers that will bloom all summer long. Garden Phlox is attractive to hummingbirds and butterflies. An old fashioned favourite, Phlox can be used in formal borders and is often seen in cottage gardens. It mixes well with other perennials and provides long summer bloom. 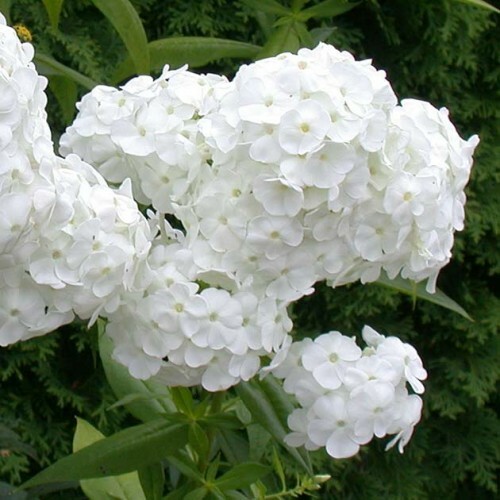 Tall, border phlox, with their fragrant flowers in large trusses on sturdy stems, are particular favourites. All species of Phlox are native to North America.